I'm not a big fan of car magazines that attempt to attract readers to their lack-of-content pages with pictures of barely-dressed women on the covers. However, this samurai-themed Datsun 521 drawing is so appropriate and well done that I had to post it. It's not a Datsun 510, but the 521 truck is similar enough in style that I like it nearly as much as the 510. 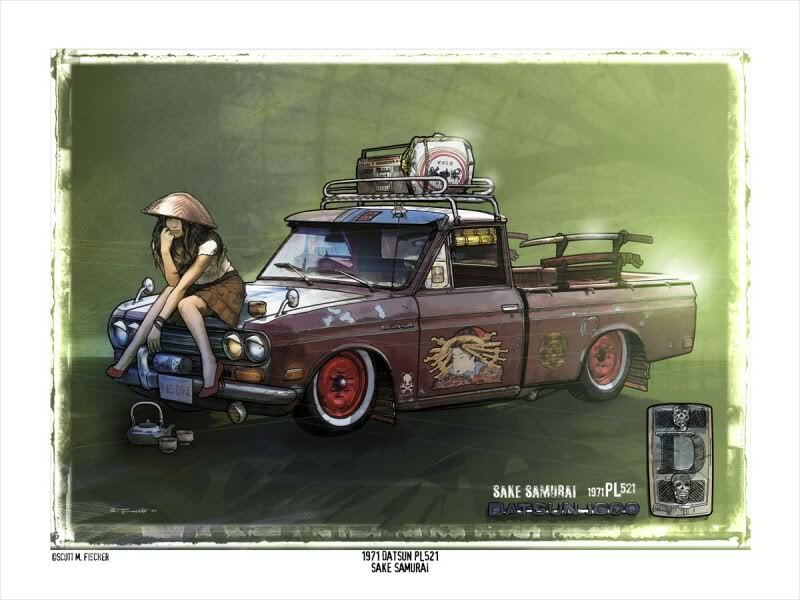 The artist is Scott Fischer, who is also a member of the datsun forum I frequent. You can see more of his outstanding artwork here: http://www.fischart.com. Yeah, his work is amazing. You should see his other work on his site. I guess he's done artwork for Magic: The Gathering cards, too. Crazy. Very cool.